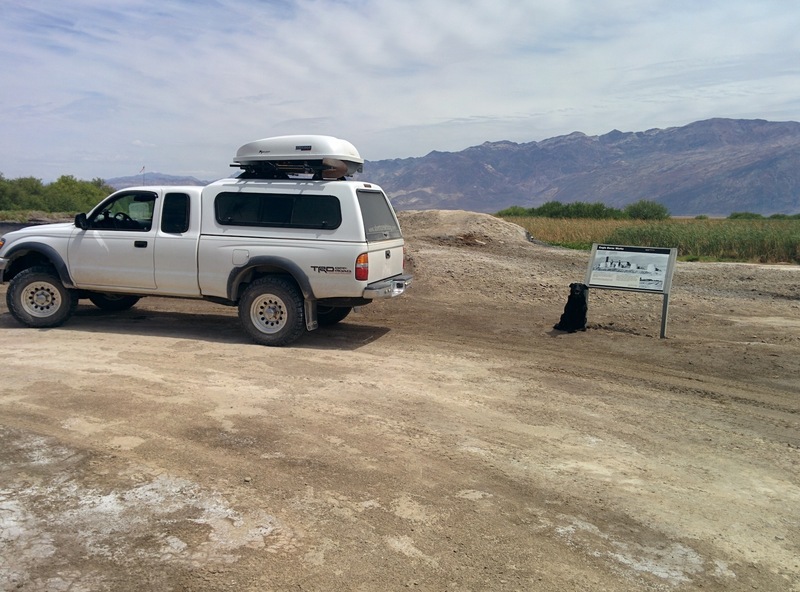 While staying at the Geologists’ Cabin we decided to take one day and head into Furnace Creek to stop by the main Ranger Station and maybe stop and see a few sights on the way there or back. We left early and headed out Warm Spring Canyon. On the way over Warm Spring Road we saw the Warm Spring Camp and several old borax or talc mines but decided to save them for another day. The going was slower than we expected because of varied road conditions. Our average speed was probably in the 15 mile per hour range. It took about 90 minutes to make the 21 miles or so from the Butte Valley to the Southern entrance onto Badwater Road. Once we finally made it to blacktop we first aired back up and then headed North. 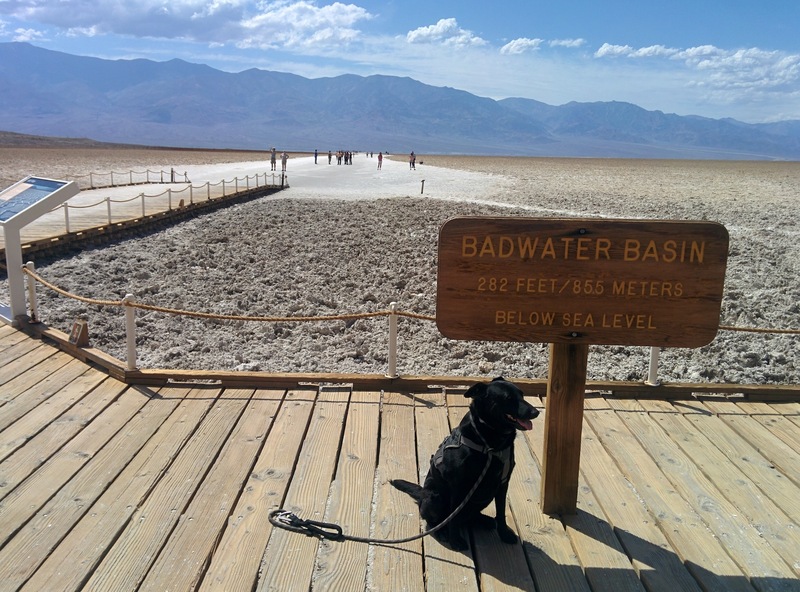 Our first official stop was at Badwater Basin for a quick picture at the sign 282 feet below sea level. Continuing North on Badwater Road we next came to Natural Bridge Road. I’m guessing it is not as awesome as say, Moab, but still… a Natural rock Bridge, cool. We still don’t know as we never made it all the way to the formation. So, first you have to get up the absolutely atrocious washboard road. Truly the worst of the trip. Several small rental cars with all-season tires were ahead of us and were crawling along at about 5 miles an hour even though the speed limit is 25. I get it, any speed above, say, being in Neutral was an exercise is getting the fillings bounced out of your teeth. I wouldn’t know about that since I have never had a cavity 😉 Regardless and unintuitively, sometimes on roads like that the best course of action is to go fast enough that you skip across the tops of the little washboard bumps and therefore smooth out the ride considerably. So, not wanting to eat their dust or pound Willow and I to death we put it in 4-wheel drive and gunned it past those laggards. We made enough dust that we could not see if we were getting dirty looks as we passed the sloths. Of course, once we got there we found another one of those all too common “No Dog” signs and, not wanting to push our luck after Badwater Basin and wanting to get up to Furnace Creek before it got too hot, we just turned around and headed back out. Continuing North on Badwater Drive we next saw a sign for the Devil’s Golf Course and decided, “Why Not.” We turned onto the slightly washboarded road (but way better than the road up to Natural Bridges) and headed down into the basin where this natural formation was. 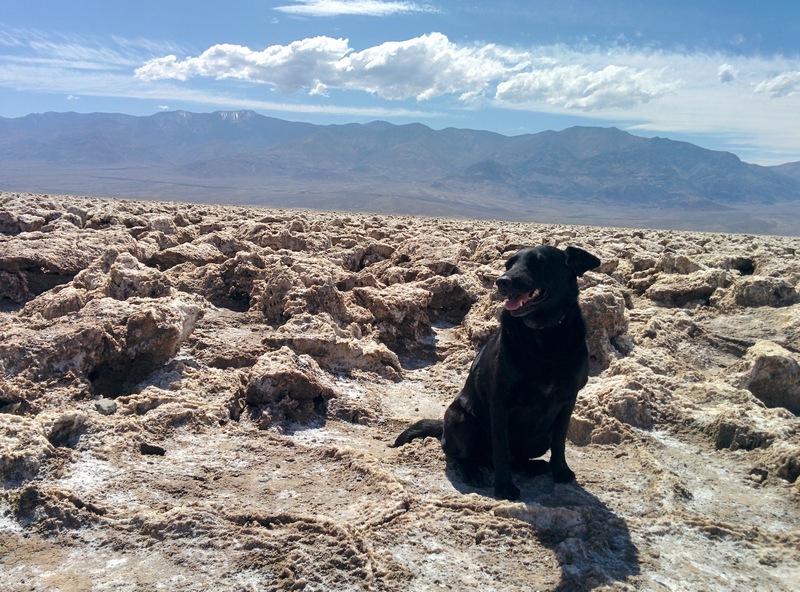 We stopped and took a look at the crystallized salt formations, read the informational signs, took a few pictures of my gorgeous girl looking bored that she was being made to pose for pictures and then took our leave. 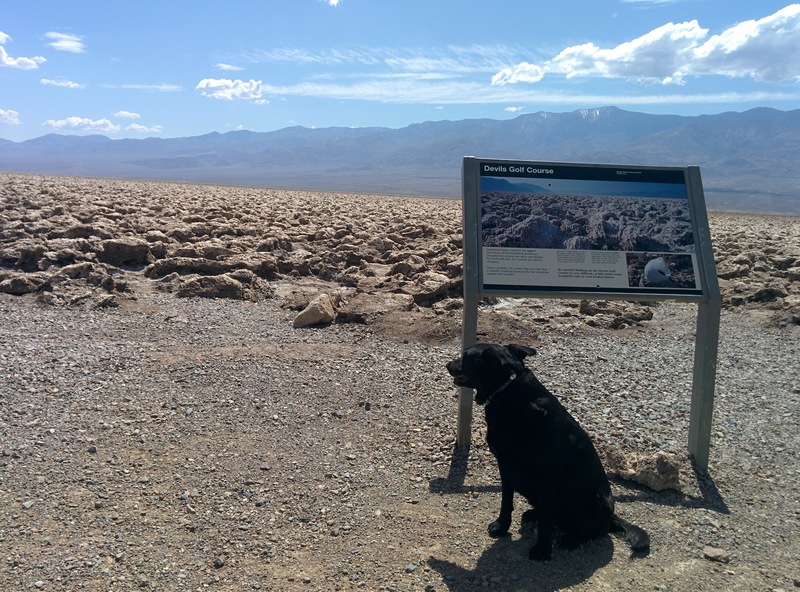 No mention was made on the sign as to why this is called Devil’s Golf Course so we decided on our own story. I am not a golfer. At all. I’ve been on a golf course actually “playing” golf maybe a half-dozen times in my life. This is not my game. For me, a “good” round of golf is when I don’t loose a ball a hole. I’m also pretty sure Willow has never played the game. So, as non-golfers we decided that this attraction’s name is in reference to what would happen if you, as a golfer who enjoys the game, died and went to Hell. We think that you’d be forced to play a never-ending round of golf out among the deep salt fissures and would forever and ever be losing not just one but hundreds of balls per hole since it would be practically impossible to ever find a particular golf ball among the nooks and crannies especially after it had landed and then bounced around off the hard, uneven salt formations. Are you a golfer? Does that sound like Hell? The next “attraction” we came to was Artist’s Drive. It sounded like something visually appealing and so we turned into the one way, one lane road for the 3.5 mile loop. Sadly a rental RV had turned onto that road just before us and, between driving glacially slow to look at the “sights” and having trouble driving the RV up some of the hills we were stuck behind the monstrosity for the entire 3.5 miles and 20+ minutes of torturous boredom. I put “sights” in quotes because they were underwhelming at best. I guess I was expecting more colorful, more finely defined striations and geologic layering in the mountain sides or more expansive vistas but…meh. Or it could more likely have been that I was just pissed at being stuck behind an idiot in a rental RV driving way too sloooowww and was in that sort of mood so…. We finally made it to the end of that road and happily the RV turned South to head towards Badwater Basin and we headed North without automotive impediment. We eventually came to the Badwater Road/Hwy 190 intersection. Over to the right across the way sat The Inn At Furnace Creek. We instead headed to the left and soon passed The Ranch At Furnace Creek (the thoughtful, original naming scheme boggles the mind) and then the gas station where we filled up our tank and dumped a plastic grocery store sized bag of garbage we had collected or produced in the past week. A half a block past the gas station is the entrance to the Furnace Creek Visitor Center and we turned in. We were lucky enough to be able to take advantage of one of the covered parking spots available. Even with our Yakima RocketBox up top we are only about 8′ tall and we had a couple of feet to spare. 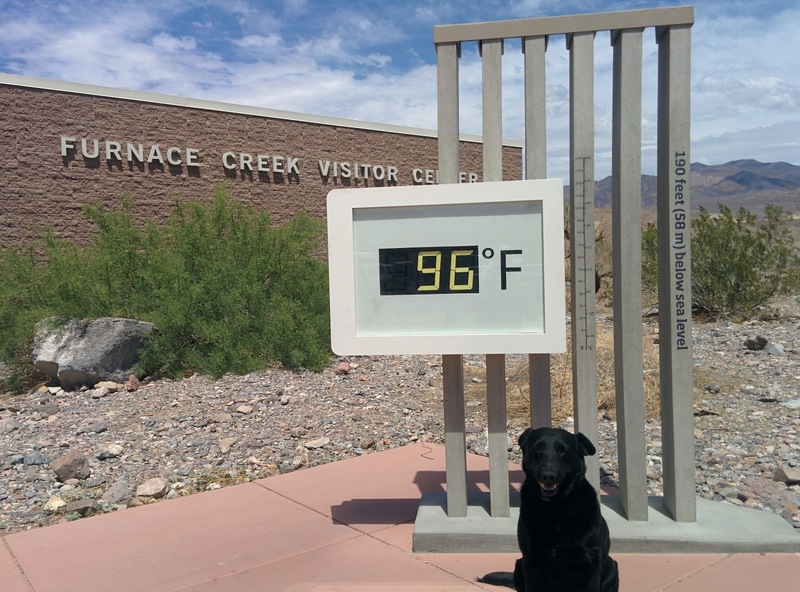 Right in front of the Visitor Center Entrance is a digital thermometer and we stopped to snap a quick picture of my fuzzy girl. It was an even 100 degrees mere moments before I snapped the picture but a breeze blew through and lowered the temp to the indicated 96. For future reference, over by the outside bathrooms at the Visitor Center is an area where you can fill up your water bottles with a counter keeping track of how many plastic bottles have been kept out of a landfill by using a reusable bottle. There is also a regular spigot there so you can fill up larger containers. We lugged one of our Military Water Cans over and grabbed a cool, clean 20 liters for free. Nice feature for when you are in the middle of a desert. I filled up Willow’s collapsible RuffWear water bowl with cool water from the available fountain and tied her up in the shade of the entrance way awning. As she waited outside and made friends with a group of German tourists I went inside to grab a paper copy of the Back Country Roads Map so we didn’t have to pull out our tablet and look at the pdf version and we could write on this map to make notes and mark where we had been and places we wanted to explore. Someone had donated a copy of the National Geographic Trails Illustrated Map of Death Valley in the Geologists’ Cabin and we had found that useful enough to want our own copy. The bookstore inside had them and so we picked up a copy. Sadly, they charged the suggested retail price of $11.99 whereas you can get it for $2 less through our link to Amazon above 😉 We also bought a small book, Mines of Death Valley by L. Burr Beldon. We were told about a good book on the cabins of Death Valley but they were out of stock at the time. 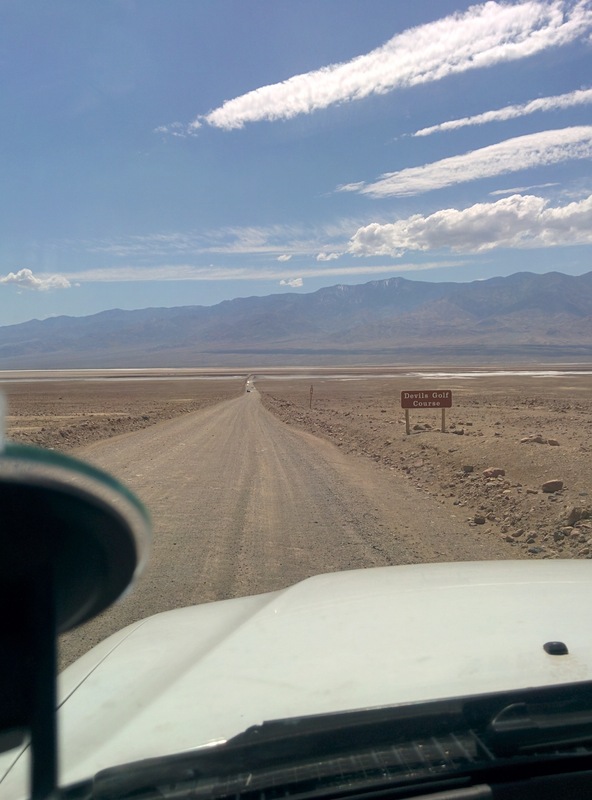 We took our leave of the Visitor Center and headed back Southbound on Badwater Road. When we came to the turnoff for the Northern entrance to West Side Road we stopped, aired down our tires a bit and headed onto the semi-maintained road. 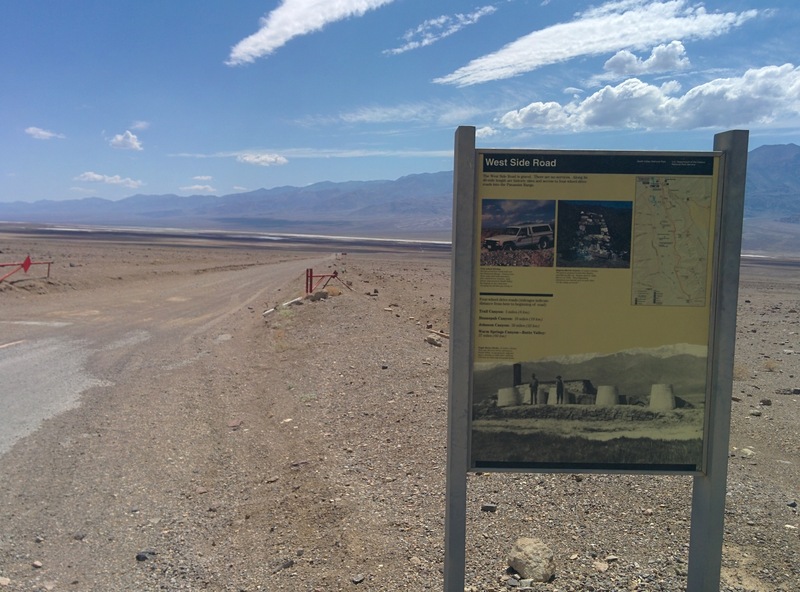 Besides that ugly truck on the sign there is also mention of the remains of an old Borax works and the grave of two of the more famous old-time prospectors of this area, Frank “Shorty” Harris and Jim Dayton. The road is okay. Some sections are nice, smooth and covered by shallow sand. Some are a bit wash-boarded and so your decision is whether to drive the posted speed limit and get shaken baby syndrome or ignore that suggestion (all speed limits are suggestions as far as we are concerned) and float across the tops of the ridges. Guess which one we decided on? Still other sections have devolved into softball-sized chunks of rock and your choice is made for you…slow. After passing a few signs indicating canyon roads heading to the West that you can explore in the right sort of vehicle (Trail Canyon and Hanaupah Canyon are two of them) we eventually arrived at a point essentially directly across the basin from Badwater and came across Shorty’s Grave. There was a sign a bit sooner directing you to Shorty’s Well but we were more interested in the grave site and so bypassed the spring. 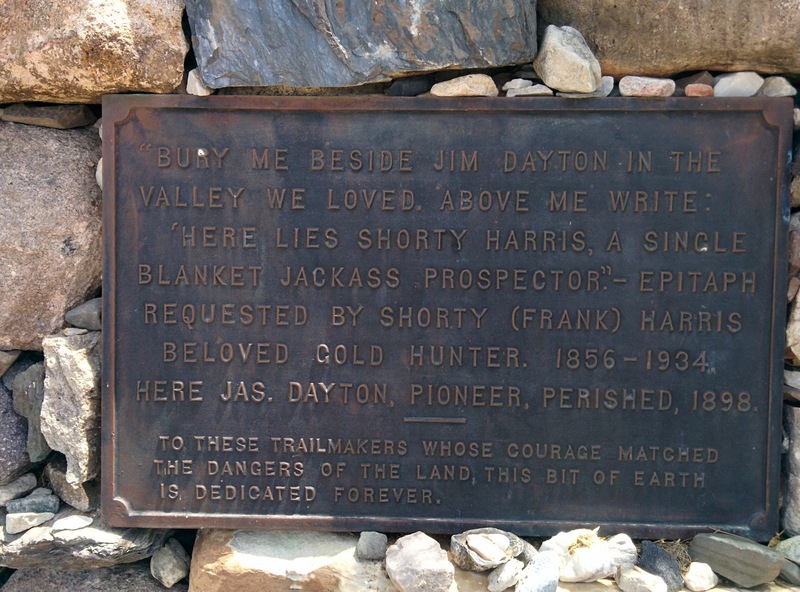 Interestingly, the little sign on West Side Road indicating the grave site makes no mention of Jim Dayton and only says “Shorty’s Grave.” The grave marker itself though does list the names of both old prospectors and their dates of passing. Another slight discrepancy we noticed: the section mentioning the grave on the West Side Road sign says Jim Dayton died in 1899 while the grave marker itself says 1898. 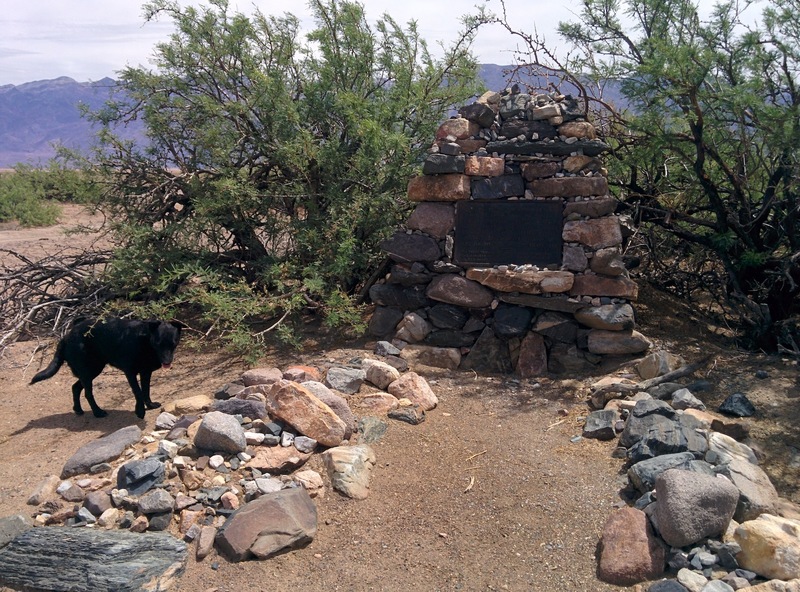 After we placed a small stone on the grave marker which seemed to be a standard practice of those who had visited before us we returned to the Tacoma and continued South bound. 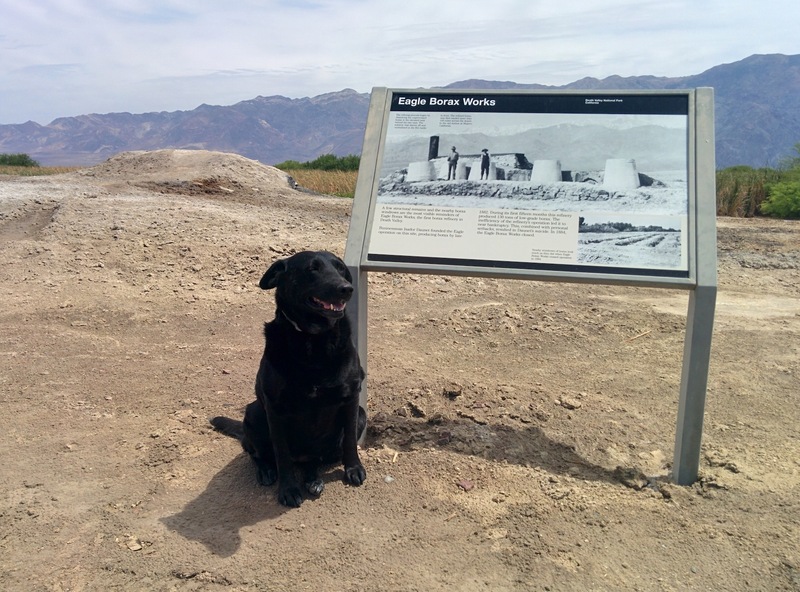 A mere half mile later we came across the sign pointing the way to the Eagle Borax works and turned in to take a look. From the picture on the main West Side Road sign and other pictures we had seen at the Visitor’s Center we were expecting something…more. The sign showed more than the site itself did and gave a brief overview of the short life of this venture and how its failure caused its founder, Isador Daunet, to commit suicide. From reading that book Mines of Death Valley we have since learned that Mr. Daunet was a family friend of one of the more famous Death Valley historical figures, Jean Le Moigne and that the reason Mr. Le Moigne originally came to Death Valley was because Mr. Daunet had called for Mr. Le Moigne’s assistance in his Borax endeavors. Mr. Le Moigne (or Lemoigne) was a University graduate in Engineering and Chemistry and probably could have devised a more efficient and pure process for extracting borax but the journey from France took too long and by the time Jean arrived it was already over and Daunet had done himself in. Mr. Le Moigne’s name now graces a canyon in the Valley and his grave is marked on US Geological Survey topographical maps of the area. Once we reached the turn off back onto Warm Spring Road we headed back up and over the canyon into Butte Valley and the Geologists’ Cabin for a well-deserved cool beverage – mine from a bottle, the girl’s from a bowl.